Primary Colours – Red, Yellow and Blue. Tertiary Colours – Colours formed by mixing one primary and one secondary colours. Red – Orange, Red – Violet, Yellow – Orange, Yellow – Green, Blue – Green, Blue – Violet. 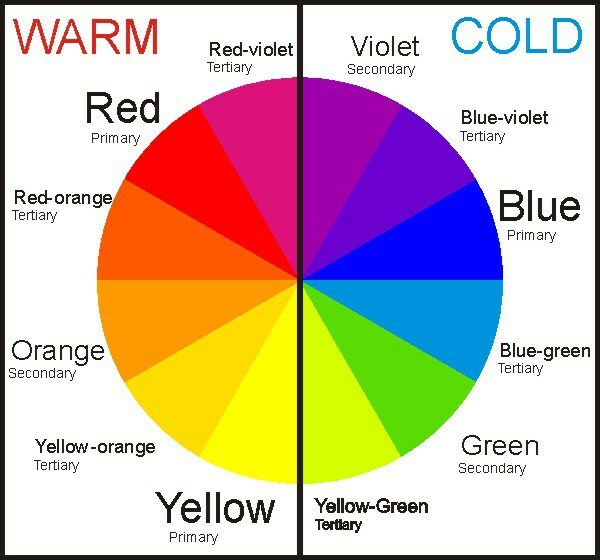 The colour wheel also separates warm colours and cool colours. One side of the colour wheel has warm hues and others are cool hues. Warm hues/colours give the feeling of warmth as they remind of sun, fire. Cool hues/colours give the feeling of coolness as they remind of water, forest (greenery). 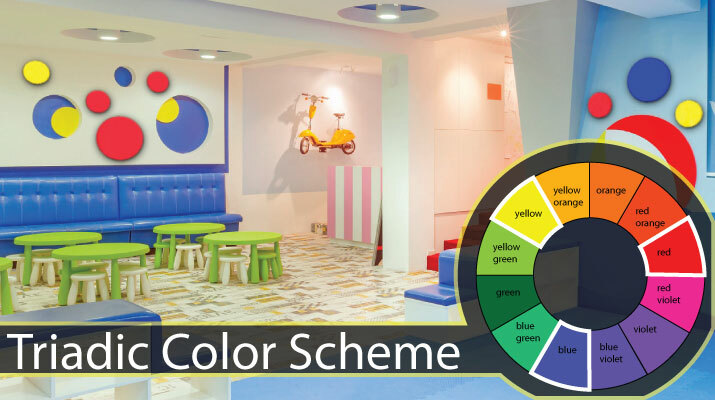 As now we are well aware with the colour wheel let us now know about different colour schemes formed by selecting different colours from colour wheel. Analogous Colour Scheme includes any three consecutive colours of the colour wheel. For example – yellow-orange, orange and red-orange as shown figure. As set of analogous colour scheme are consecutive, they have colours in harmony. These colours have one colour in common, which will dominate the other two colours. The other two colours compliment the dominant colour. Complementary colour Scheme has any two colours that are opposite on colour wheel. For example – blue and orange, red and green, etc. It is high in contrast and goes well with traditional theme room. Split complementary colour scheme has set of three colours. Select one colour from the colour wheel. After selecting one colour from the colour wheel select other two colours that are adjacent to its complementary colour. The set of these three colours form split complementary colour scheme. Triadic colour scheme has set of three colours that are equidistant from each other. Joining these three colours forms equilateral triangle. As it is a set of three equidistant colours, four combinations of triadic colour schemes are possible. Triadic colour scheme includes combination of both warm and cool colours hence it is well balanced colour scheme. Tetradic Colour Scheme has four different colours formed by selecting a set of two complementary colour schemes. It is also known as double complementary colours. As it offers more colours it becomes difficult to balance all four colours. Therefore, in tetradic colour scheme always subdue one or more colours. In the illustrated figure above tetradic colour scheme is Green – Red, Violet – Yellow; where green colour is dominating. Colour Schemes are of great help for selecting colours. But the difficulty is how to start with colour scheme. For this, first select one colour from the colour wheel that you want to be dominating. After selecting dominating colour choose one colour scheme. Go for analogue colour scheme if you want to harmony. Complementary colour scheme is suitable if you want transition of colours. Split complementary goes well as if gives transition with mild contrast. Triadic and Tetradic colour scheme are good options when you want more colours. These colour schemes help you to pick colours wisely as well as saving on time.